I hope I can collect a bit of RGB too... but the weather... so just simple plain H-alpha. 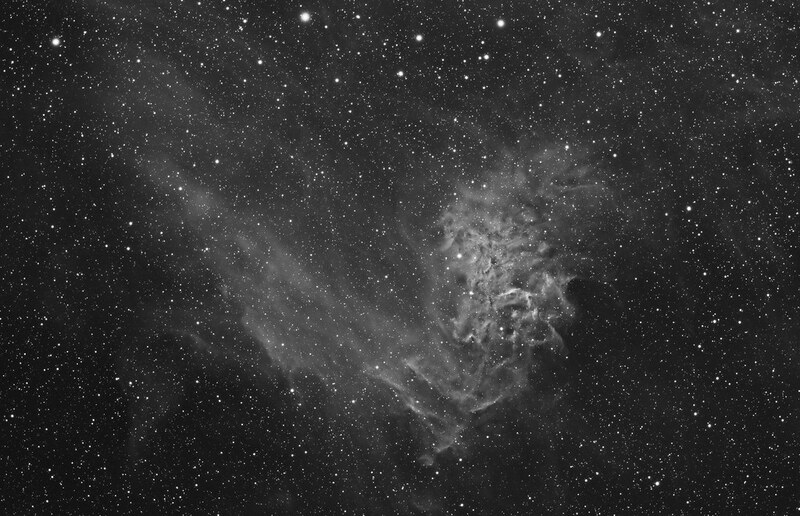 I have a feeling I could collect more photons to get better details in the outer parts. But did I mention the weather? That's beautifully done. I do hope you get the chance to add color soon. But your monochrome rendering certainly brings out the unique ripples of this nebula. I tried, but unfortunately a "small" problem came up. I managed to take new blue subs but after integration the stars were just a little bit smaller. Actually this was the first time I took RGB subs with my little scope and the reducer: this was mainly my "large emmision nebula setup". Looks to me that I ran into the classic blue bloat problem: I use Baader filters and the blue cuts off somwhere at ~380nm. That's probably to much (or less...) for my scope. I'm not sure if I end this litte RGB experiment or try an other blue fliter. The Astronomik deep sky blue filter seems to fit better (cut of at ~420nm), but the filter is 1mm thick. This would change my backfocus because the Baaders are 2mm thick. Hmmm.